Bourton-on-the-Water is known as the Little Venice of the Cotswolds with several small bridges spanning the River Windrush. Bourton-on-the-Water is highly popular with tourists and has many shops, eating places, and excellent choice of Bed and Breakfast (B&Bs) accommodation to suite all tastes and budgets. Hanna & Beverley Gent welcome old & new customers to their newly established home right in the heart of the very lovely village of Bourton on the Water, sometimes called the Venice of the Cotswolds because of the River Windrush that winds its way through the main street. At the very end of Sherbourne Street you will find Pock Hill Lane, overlooking a beautiful Meadow. In season it will be filled with baby lambs and rabbits, you may even see the occasional fox. You will also be able to see the stable hands taking the horses out for their exercise from the local stables. These are all wonderful views, from your bedroom or from our dining room window. Our house is situated in a very pretty and very quiet corner. You could take afternoon tea & biscuits (free on arrival if requested). 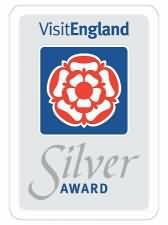 We are very happy & proud to announce that we have again achieved the near top accolade of Four Stars and a Gold award from the English Tourist Board. 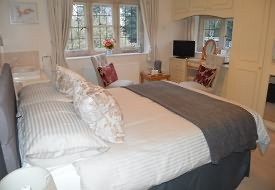 We have four en-suite double rooms available. One is on the second floor with panoramic views and three are on the first floor overlooking the Meadow. One room has a four poster bed. All rooms are provided with: colour television, oil filled radiators, spare blankets, hair dryer, electric fan, a copy of the bible, tea & coffee making facilities. A small refrigerator holds a jug of fresh milk, extra cartons of milk and bottled water (a bucket of ice is available on request). Broadlands Guest House, with an official Enjoy England four star rating, is situated in a quiet street, a few minutes level walk from the beautiful village centre and its many attractions. 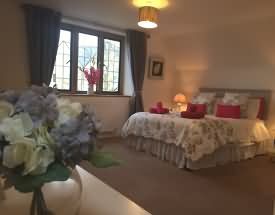 We offer Double, Twin-Bedded and Family Room accomodation, tatsefully furnished to a high standard in a friendly home-from-home atmosphere. 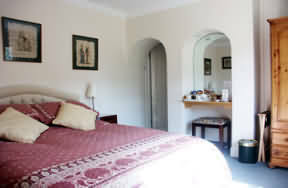 All rooms have en-suite bathroom and tea/coffee making facilities, colour TV, hairdryer, luggage rack, and radio alarm. For those special occasions we can offer our King Size Suite, with en-suite bathroom and lounge area, colour TV, or our King Size Room with en-suite bathroom and colour TV etc. Breakfast is served in our beautiful Victorian Conservatory, and for your comfort there is also a Guest Lounge. Outside there is a patio garden and private car park to the rear of the house. We trust that you will find Bourton-on-the-Water as delightful as we do, and hope that your stay with us will be pleasant one. Rooms are available from 2.30pm on the day of arrival. Guests are requested to vacate their rooms by 10.00am on the day of departure. Twin Bedded Room with en-suite Bathroom £80 per room. Double Bedded Room with en-suite Bathroom £80 per room. King Size Room £80 per night. 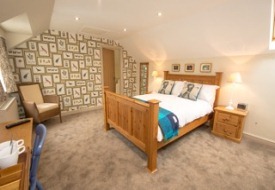 King Size Suite £90 per night. Child under 10 years sharing parents' accomodation £20. Baby cot available by prior request £5. All prices include Full English Breakfast and VAT. Service at Customer's discretion. 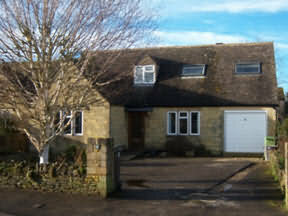 A Cotswold stone house just 8 minutes walk into the village of Bourton on the Water. We pride ourselves on style and comfort from tastefully furnished and very spacious en-suite rooms to our delicious English breakfast cooked fresh to order and served in our traditional dining room. 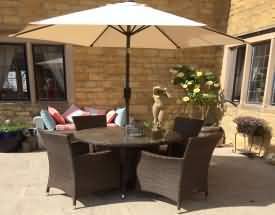 After a long day exploring the Cotswolds you can sit and relax in the garden with a nice cup of tea or a bottle of wine. The Cotswolds offer something for everyone. Romantic weekend for two or a family fun holiday. 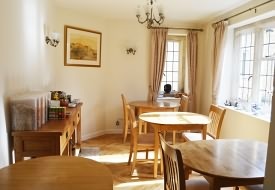 We have two double rooms on the first floor and a very spacious family/twin room on the ground floor. All three rooms make up the cottage which is adjacent to the main house. 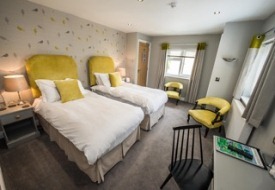 All rooms are en suite with colour TV, Tea and Coffee making facilities, hair dryers and clock radios. There is also two large double/twin rooms in the main house. 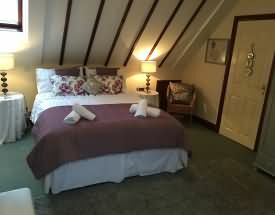 Prices start from £80.00 per room per night (based on 2 people sharing). We have ample parking spaces within the property. No Smoking or pets. Jayne and David welcome you to their bed and breakfast accommodation. We do not take children as we cater mainly for couples wishing to relax and enjoy all the unique splendour of the Cotswolds villages and countryside. We offer Four Star Gold Award accommodation and an award winning breakfast in an ideal location only a short level stroll from the beautiful village of Bourton-on-the-Water, famously known as 'The Venice of the Cotswolds'. 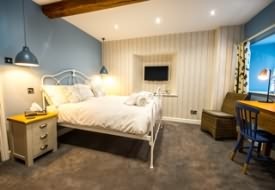 Each room comes complete with a flat screen tv with Sherborne and Windrush rooms being Smart Tvs with complimentary Netflix, a small Ipad/notebook for internet and email access, a radio with an ipod docking station, iron and board and a hairdrier. 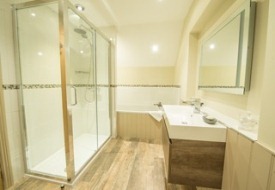 All rooms are equipped with en-suite shower rooms featuring a rainhead and handheld shower. Heating is thermostatically controlled and adjustable in guest rooms. Each bedroom is supplied with a well stocked beverage tray and complimentary toiletries in the bathroom. Breakfast is served from 8.30am to 9.30am in the relaxed atmosphere of our light and airy Breakfast room, overlooking the garden. Our breakfast consists of a choice of starters from the cold breakfast buffet, followed by our traditional, full English breakfast, fish dish or a light alternative, using fresh quality, local produce wherever possible. If you have any special dietary requests, such as vegetarian, vegan, coeliac, etc please advise us at the time of booking. 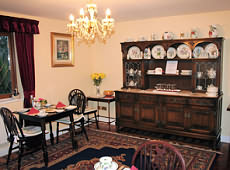 Prices start from:- £70.00 per double room per night inclusive of breakfast. 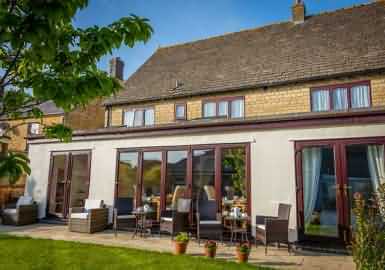 Mill View Guest House nestles in the Windrush valley, only 5 miles from Bourton-on-the-Water. The village of Naunton is quiet and unspoilt with easy access to the Cotswolds. Millview Guest House was built in 1943 and was originally called No. 2 Agricultural Cottages, having been built for local essential farm workers during the war. It has been Patricia's family home since 1947. 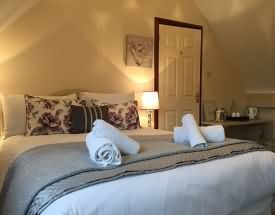 In recent years we have extended, refurbished and improved our house to provide three comfortable and well appointed en-suite guest rooms. There are two double rooms and one king size/twin room. The ground floor room has wheelchair access with a purpose made ramp at the rear of the house to assist guests with limited mobility. 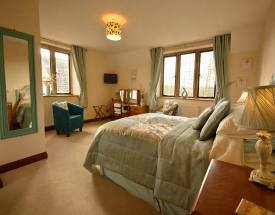 Each room has a colour television, hair dryer and tea and coffee making facilities. A hospitality tray with nibbles, biscuits, Horlicks, Ovaltine, and sherry is also provided for your enjoyment. Each room has an en-suite shower room with wash basin and W.C. The upstairs shower rooms have a double size shower unit and the ground floor has a flat floored open unit with a shower chair. All showers are pump assisted. We open our living rooms to our guests where they can sit more comfortably to chat, read or watch television. Our home is yours for however long you stay. We do have two small cats, who are very friendly but not allowed into any of the guest bedrooms. We are also a no smoking house. 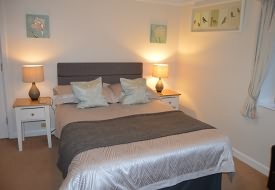 The Lansdowne (formerly) Lansdowne Villa Guest House is family owned and run by Anthony and Cheryle who provide a warm welcome on arrival and during your stay. They purchased the business in late 2014 and have been embarking on a total upgrade of the property with 11 rooms now completed as well as the hallway, and dining room. The Lansdowne is well on its way to becoming a contemporary guest house whilst retaining much of the original charm associated with this victorian building. Whenever the subject of the Cotswolds is discussed two or three villages are always mentioned; Bourton on the Water is one of them. The Lansdowne is acknowledged as a well known landmark in the area, situated at the quiet end of the main street it is just a three minutes level walk to the village centre. The 13 bedroomed en-suite rooms offer tea/coffee making facilities, flat screen TV’s and Free WiFi throughout the building, rooms also have hairdryers and some rooms now have ironing facilities. we also offer off road parking for our guests. An award winning English breakfast is served in our breakfast room alongside a continental selection including fresh fruit, pastries, yoghurts & cereals, cold meats and fresh bread rolls. We also offer a selection of herbal teas and there is a selection of gluten free cereals or vegetarian options. We also offer a Z bed as an additional bed for children up to the age of 12 years of age. If you require a cot we can also supply this for a baby together with a high chair at breakfast. 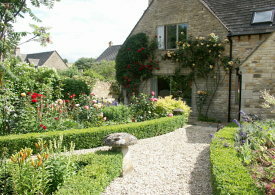 Old Stones is a solid Cotswold Stone house offering our guests spectacular views with one double/twin room. The double/twin room has its own TV and hospitality tray with WIFI access. 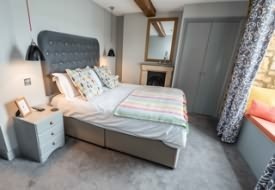 Enjoy the beautiful Cotswold countryside from this conveniently situated bed & breakfast located in the stunning village of Bourton-on-the-water. The Glyn family would like to welcome you to their newly created suite set in the delightful village of Bourton-on-the-Water. 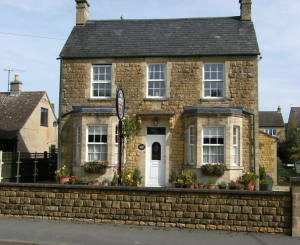 This conveniently located B & B is 2 minutes walk from the beautiful high street with its abundance of tearooms and pubs. It is the ideal place to base yourself to enjoy and explore all that the Cotswolds offer, from the miles of stunning walks to the farm parks and picturesque villages. We welcome well behaved dogs with their own bedding. This is the perfect accommodation for both families and couples. Check-in from 2pm (unless otherwise pre-arranged) and room to be vacated by 10am on day of departure. 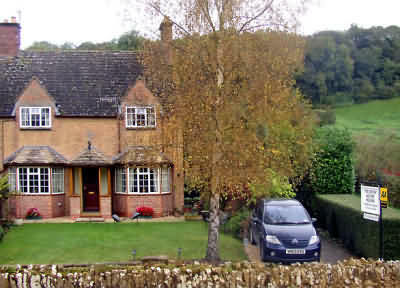 Jenny and Bernard warmly welcome you to their Bed and Breakfast located in the beautiful Cotswold village of Bourton-on-the-Water. Situated at the quiet end of the village and yet only 8 minutes' walk to the village centre and 150 yards off the Fosseway. Windrush View overlooks the River Windrush with open fields beyond, and is a detatched stone built house with ample parking facilities. 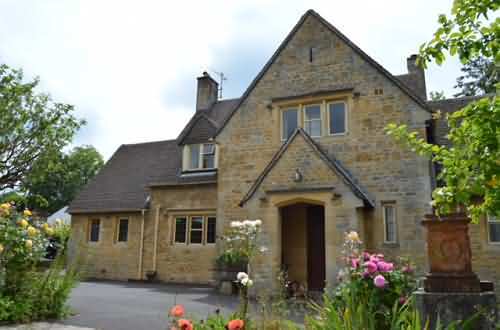 Windrush View Bed and Breakfast is a lovely traditional Cotswold stone house with fine views of one of the main attractions of Bourton-on-the-Water, the tranquil meandering River Windrush, which flows through the village centre. 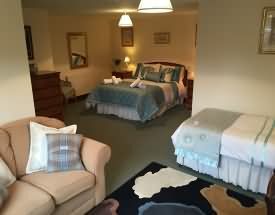 We have three letting rooms which can either be arranged as King Sized Double Rooms or Twin Bedded Rooms. They are all en-suite and all overlook the River Windrush with open fields beyond. The Guest House, which is a non smoking establishment can offer you either a vegetarian or a full English breakfast, cooked to order, together with fruit juice, cereals, toast and either tea or coffee and is served between 8-30 and 9-00 or earlier if requested on arrival. All rooms have Colour T.V. and a Courtesy Tray. There is ample parking for at least 5 vehicles. on the High Street of Bourton-on-the-Water. Our Cotswolds accommodation offer our guests a friendly and enjoyable stay, with a traditional full English Breakfast in the morning. 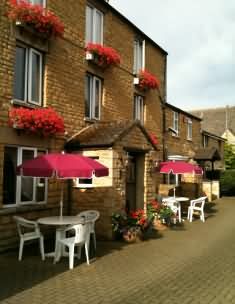 If you are visiting the Cotswolds, you will find there is plenty of parking space and a warm atmosphere at Manor Close. Experience a truly English country house feel and look, as well as be able to spend time in our green and pleasant garden. 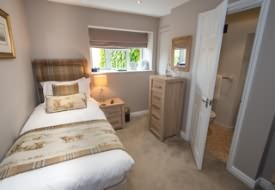 Our rooms are spotless and cosy and you will be glad you chose to stay in Bourton-on-the-water with us. Surrounded by a large pretty walled garden for guests to enjoy with outdoor seating provided, whether on a summer's day or on a warm summer's evening, guests delight in the ambient atmosphere. All our en-suite rooms are tastefully furnished with all the necessities. We have a ground floor room available and before you depart for the day we serve a hearty full English breakfast (vegetarian available upon request). To fully experience what the Cotswolds is all about, you will be glad you stayed with us at Manor Close and stayed in a traditional Cotswolds Bed & Breakfast. 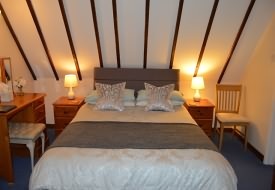 Prices start from £75 per night for a twin/double (based on 2 people sharing). All prices include Full English Breakfas (vegetarian option upon request).